Wednesday May 7 is Fair Trade Day. Add your voice to the movement to stop “Fast Track,” which will be used to push the Trans-Pacific Partnership corporate dominance treaty through Congress. 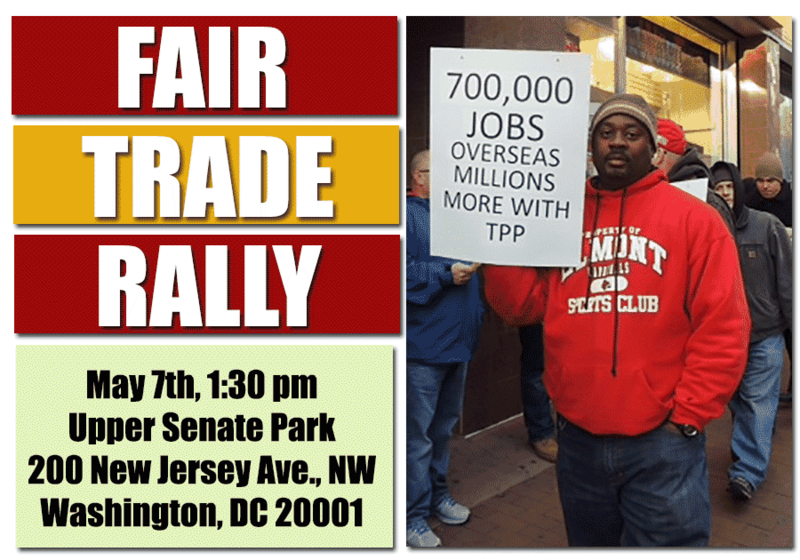 There is a “Fair Trade rally” in the Upper Senate Park in Washington, D.C. at 1:30 p.m., organized by Communication Workers of America (CWA). You can text FAIRTRADE to 69866 to RSVP and get updates. CWA has a Facebook page for the event. ExposeTheTPP also has a facebook Page for the event. When: Wednesday at 1:30 p.m.
What: Join with MoveOn members and our progressive allies as we rally in the nation’s capitol against Fast Track and the Trans-Pacific Partnership (TPP). We’ll be joined by members of Congress along with allies from Public Citizen and organized labor, social justice, environmental, food safety and Internet freedom groups. After our rally in the park we will deliver petitions to Congress demanding that they “Vote NO on Fast Track,” and “Stop the Secrecy” by making the TPP negotiating text public. Communications Workers of America (CWA) is sponsoring the rally, and our allies at Open Media will be broadcasting a light projection on a D.C. building that night, showing how many people have signed petitions! In addition, the Fair Trade Resource Network has a list of events in the US and Canada. There are also numerous events planned for Saturday. The World Fair Trade Organizaton has a list of Saturday events here.